Danish designer and builder Tuco Marine has delivered what is the first vessel in its ProZero workboat range to have been specially customised for deployment in the aquaculture sector. 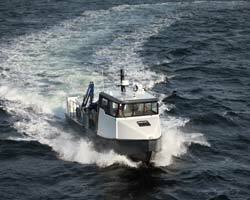 The 15m ProZero High-Pressure Cleaning (HPC) boat, christened Klara 1, was produced for Norway’s AKVA Group, which provides support services to the fish farming sector, including provision and maintenance of plastic and steel fish cages, camera systems, nets, feed barges and feed systems. The HPC boat, which spent late July and early August undertaking internal tests of ROV equipment, will work out of the Haugesund area in Norway. She measures 14.96m x 3.85m overall, has a capacity for four persons and features a draught of approximately 1.08m at full load (3tonnes). The boat’s propulsive arrangement comprises a pair of inboard Volvo Penta D11 diesels, rated 459kW apiece, connected to twin Volvo Penta IPS 800 pods with forward-facing and counter-rotating, stainless steel propellers. Jonas Pedersen, Tuco Marine managing director, tells Ship & Boat International: “Klara 1 is built from fibre-reinforced Vinylester – in our general experience, this enables us to build hulls that are up to 40% lighter than equivalent aluminium hulls.” This material comprises a mixture of glass and carbon fibre, sandwiching a PVC core. Combined with the propulsive set-up, this lightweight approach to structure has enabled Klara 1 to attain a top speed of 34.8knots, as well as an enhanced level of “control and handling” and significant fuel savings, Pedersen says. Klara 1’s aft working deck spans 25m² and has been equipped with a 2.5tonne-capacity Guerra Marine M65.20A2 hydraulic crane, featuring a SWL of 0.77tonnes at 7.2m, as well as a 1tonne-capacity capstan and six mooring bites. In terms of onboard capacities, meanwhile, Klara 1 can store up to 4,600litres of fuel and 500litres of fresh water – helping to guarantee a range of 800nm at 25knots – as well as 500litres of sullage. Two berths (with an option for a third) are situated in the forecastle, to facilitate overnight operations.